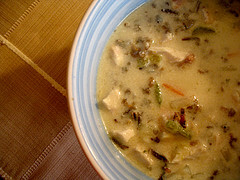 This Wild Rice Soup recipe is from my niece Lora. We had a family week together at Pine Lake in Wisconsin and she made this soup to share. In a stockpot melt the butter and add celery, carrots, onion, thyme and garlic. Saute until vegetables are tender. Stir flour into mixture blending thoroughly. Slowly add broth stirring constantly. Bring to boil and reduce to simmers. Next add mushrooms, chicken breast and bay leaves and continue to simmer until chicken is heated through. When ready to serve, mix in the half&half and cooked rice, stir till blended. Ladle into warm serving bowls and garnish with toasted almonds. Serve with warm crusty bread. Can be made ahead and frozen - do not add the half&half until serving time.